Prof. Carl Sable received his B.S.E. in Electrical Engineering from Princeton University in 1993. From 1993 through 1997, he worked as a software design engineer at Microsoft. As part of the Excel group, he helped develop versions of Excel ranging from Excel 5 through Excel 97. From 1997 through 2003, Carl was a graduate student at Columbia University. He received his Master's degree in Computer Science in 1999 and his Ph.D. in Computer Science in 2003. As a graduate student, he was part of the Natural Language Processing research group, advised by Prof. Kathleen McKeown. 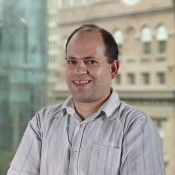 Carl’s research focused on the use of text categorization techniques to classify associated images. Carl joined the Cooper Union faculty as an assistant professor in the Department of Electrical Engineering in 2003. He was promoted to associate professor in 2009. Currently, Carl regularly teaches a few of the required courses in the Computer Engineering track of EE, including Data Structures and Algorithms I and II and Software Engineering. Carl commonly teaches Master's level electives including Artificial Intelligence, Databases, and Natural Language Processing. He also commonly advises Senior Projects. Other courses that Carl has taught in the past include Digital Logic Design, Advanced Computer Architecture, and Compiler Theory. Carl has advised close to 20 Master's students so far who have completed their degrees; the topics of their theses have ranged the gamut of EE, but the majority have focused on subtopics of artificial intelligence, machine learning, or natural language processing. In addition to research through Master's students, Carl is currently one of the Principle Investigators of a funded research project involving collaboration with MaXentric Technologies. The project is funded as an STTR, currently in Phase II. The task involves the use of software defined radios, provided by Rockwell Collins, to create a Cognitive Communications Gateway Engine capable of translating signals between waveforms. Carl also voluntarily serves as the Engineering Faculty Secretary, and he helps to coach teams of students entering the annual ACM Programming Competition.